It took a lot of late night planning to choose today's running venue, but it paid off for the Runsketeers this morning. With Bethpage's trails still "out of operation" and the Runner's Edge Fun Run taking place on public roads, we decided to meet at Eisenhower Park. SIOR qualified for Boston and has been following a training program that required her to cover 14 miles today. She ran 7 miles around her local roads and then met me and TPP at the park to run seven more. I've been dealing with the beginnings of a cold that has sapped a lot of my energy. Yesterday's run on the treadmill was very difficult and I wasn't confident that I could run the miles that my Runska-buddies were planning. I was also concerned about maintaining a pace that wouldn't bore them silly. Their support got me through the distance (I hadn't run more than five miles on pavement this year). As usual, they were extremely gracious about accommodating my pace. I don't know why my stamina and performance have been so poor the last couple of months. I suspect it's due to my lack of focus and boredom from running on the treadmill. SIOR runs faster on the treadmill to get through her workout faster. I run slower so I can be more easily distracted by the TV. In less snowy times, when I'd run outside every day, it was easier for me to add speed into a run. I would also add chunks of distance by spontaneously choosing different roads to follow. I know I can easily add speed and distance when on the treadmill, but I don't. 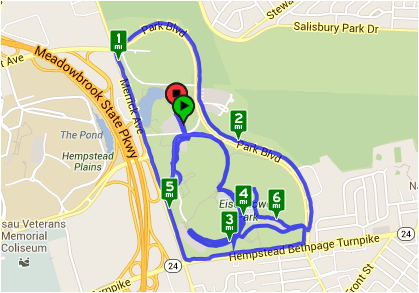 Our route today went all around, due to construction being done to build ice rinks in the park. I lagged behind my buddies by a few feet much of the time, but they worked to adjust their speed to keep me within talking distance. 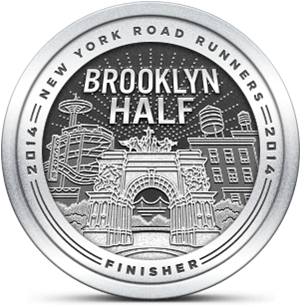 There was one point when we followed the same route that we ran on the New Year's Hangover Run. This allowed me to rest a minute while my friends followed the end of the loop and met me on the other side. So in terms of total distance, I probably ended up covering fifth of a mile less than my running partners. With the exception of a few parts on the path that required careful stepping (and a short walk) over icy snow, Eisenhower's trails were fairly clear. I didn't think I would be able to go more than four miles early on the run, but the fun of being with my little group made the distance fully manageable. Despite another snowstorm predicted early tomorrow morning and the return to Polar Vortex temperatures, I am hopeful that this snow will soon be gone and I can get outside and resume performance-focused training. I'd like to be able to keep up better with the Runsketeers so I participate more in the conversations during the run. 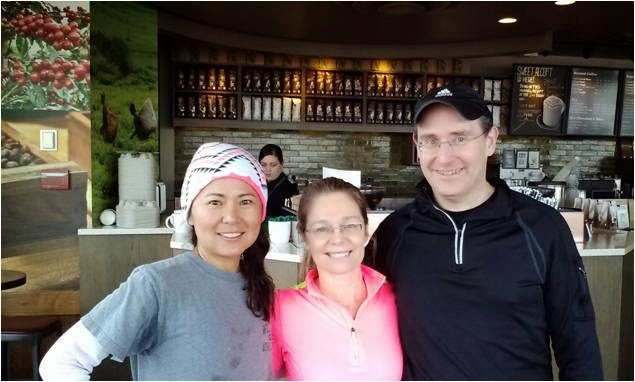 The good news is that it takes no effort to sit in Starbucks and recount the experience after the run. We were all time constrained today, but we made the best of it. It was so great to see my friends and spend time doing something we all love to do. I almost ran seven miles today after weeks of treadmill 5K's. I couldn't have done that without the Runsketeers. Count on me to keep you at an easy pace! So fun today, before, during and after. I'm going to try to up my mileage once I'm able to run regularly on the roads. I hope our run didn't contribute to your sickness. I was more fatigued during our run than I'd expected, although I did feel that I might be getting a cold. I felt okay afterward and had an active afternoon. Tuesday I was in the city for late meetings and that's when I started going downhill. Wednesday was miserable and today is a little better. Not sure when I'll get my next run in, probably not until the weekend.